In my latest addition to Dan’s Weekly Top Tips, I will be talking through the basics for a good solid pitching game and how we can simplify things. The first thing you need to do is pick your target line allowing for any contours on the green, or if you want to keep things really simple either aim for the largest part of the green or aim at the flag depending on your ability. This means that your landing point can vary, so look from behind the ball and pick out a point on your line where you want to land the ball. Then square your clubface up to that point so no errors creep in just because you haven’t lined the club up correctly. Narrow the stance slightly in comparison to a full swing and then aim yourself slightly open to the target. This will then get you set up close to the desired impact position we want to get ourselves into. This is because on short shots, you don’t have as much time to clear your hips through the ball. The most important thing is to make sure that you keep your shoulders square to your target line. Place about 70% of your weight on your front foot at address to help you hit down on the ball rather than hit up on the ball. Ball position should be just back of centre, which will also help you to hit down on the ball. However, if you want to manipulate the flight a little and hit it lower, you can move it further back. If you want to hit it a little higher, then you can move the ball a little further forward. 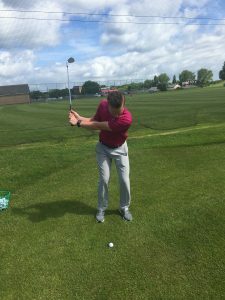 Pitching distance is very much controlled by swing length, so aim to get your left arm parallel to the ground for a 50 yard shot. This will give you the control and momentum you need to produce the correct amount of clubhead speed for the shot. As demonstrated in the picture below. 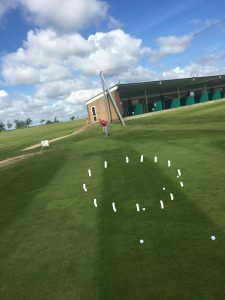 To really dial in your distance control from 50 yards, as part of this step-by-step guide to pitching, set up a decent size circle of tees/cones between the pin and the edge of the green. You can vary this according to how you prefer to play your pitch shots or your club choice. For example, if you like to use a more lofted club then you may want to have the circle closer to the hole as the ball won’t be rolling too much when it lands, however, if you will be using a lower lofted club, then set the circle further back to allow the golf ball to release and roll to the hole. Try and land the ball within the circle of markers to really concentrate on your landing point. A lot of golfers understand what they should/want be doing when hitting a pitch shot, however, they forget about the landing area. This simple drill really does just that, it allows you to solely focus on a landing area. I feel this is one of the most important parts of my step-by-step guide to pitching as it will help you judge your pitching carry distances much better.